Congratulations to the highly talented Word Wizards of Ledbury and surroundings, who came along to my Word Wizard Workshop in the centre of beautiful Ledbury, in Herefordshire, last week. Many thanks to Fran Bradley, Coordinator of the Ledbury Poetry Festival ‘Poets in Schools’ scheme, for inviting me to come back to Ledbury and work with these children. Her help before, during and after the workshops was invaluable. I first met Fran in July of this year, when she introduced our Buzzing! show at the Ledbury Poetry Festival. 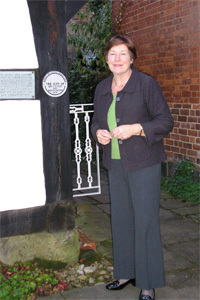 What an inspiring and dedicated lady she is, and how lucky the children of Ledbury and surroundings are to have her working to bring poetry and poets into their lives. And what did Fran think of the workshops? A memorable experience for me too. Thank you to all – children, staff, parents, Ledbury Poetry Festival staff – for making it happen. Previous ‘Yuletide York’ – theBigBuzz Christmas card is here! Next York Brownies go green!